I can get pretty stubborn about food. Once I think I don’t like an ingredient or a dish, I will avoid it forever if I don’t make myself, from time to time, retry the foods that I’ve had bad experiences with. About 9 years ago, I had a hummus pizza in a restaurant in Estes Park, Colorado, that left me convinced that I just didn’t like hummus that was heated above room temperature. (I wrote a few underwhelmed words about it here.) So, though I’ve recently embraced the joys of hot baba ganoush, I’ve stayed away from any recipe that would have me stick my precious chickpea dip into the oven. But when I saw the absolutely gorgeous Turkish Hot Layered Hummus on a blog called Panning the Globe, I just couldn’t get the idea out of my mind. Go there and look at the photos and you’ll see what I mean. 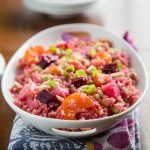 Lisa, the blogger at Panning the Globe, created her recipe after enjoying a similar dish in Istanbul. She starts with hummus made creamier with Greek yogurt and olive oil–no-no’s for us oil-free vegans. For my vegan version, I could have easily replaced the yogurt with soy or coconut yogurt, but I find even the plain varieties of those to be too sweet, and I wasn’t willing to make my own yogurt just for one recipe. So I did something a little different and used unsweetened cashew milk, hoping that it would add a little creaminess and very few calories (25 per cup). Honestly, I’m not sure it made a difference, so if you’re making my version, feel free to use non-dairy yogurt or even vegetable broth or the liquid from cooking chickpeas. I made a few other changes to fit my tastes. I’m not a fan of sun dried tomatoes, so I replaced them with fresh yellow cherry tomatoes. And to give it a little of the flavor of olives without olive oil, I added kalamata olives to the salad. 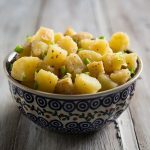 I came very close to including the pine nuts from the original recipe, but since I’d already used tahini and the olives, I didn’t want to add any more high-fat ingredients. 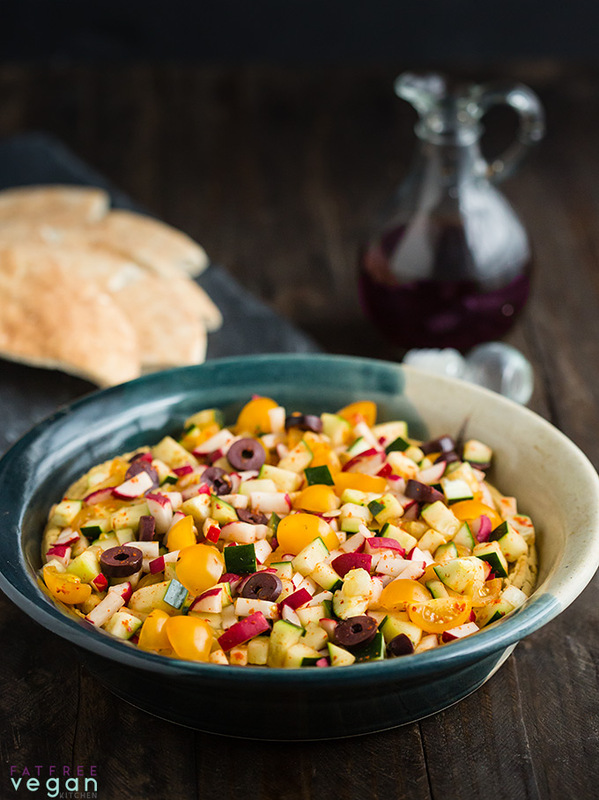 If you’re not concerned about fat, I think a couple of tablespoons of toasted pine nuts would put this rich-tasting appetizer over the top. If you’re wondering, I am now a fan of hot hummus–as is my entire family. Daughter E was initially a little skeptical, but as you can see in the photo above, she couldn’t stop eating it once she got started. 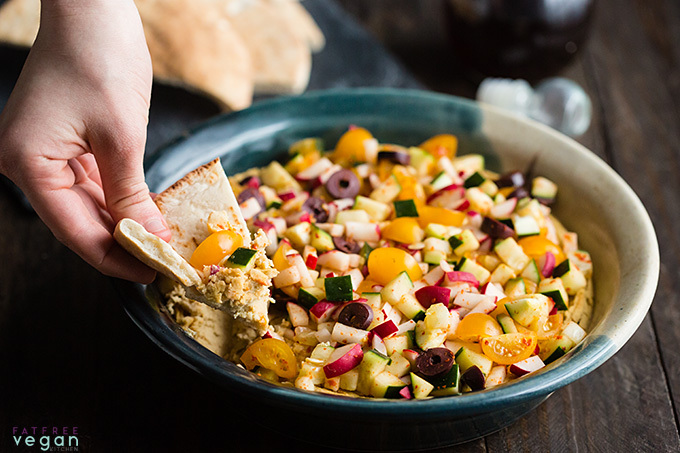 Hummus takes on an entirely new character when it's served hot with a fresh salad topping in this creamy, vegan low-fat recipe. Preheat oven to 400F. Lightly oil a shallow baking dish or pie pan. Place all hummus ingredients into a high-speed blender or food processor and blend until completely smooth. Spread into the prepared baking dish. Bake for about 20 minutes or until heated through. 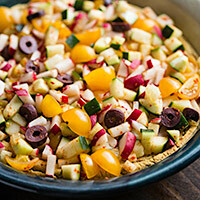 While hummus is in the oven, prepare the salad topping. Combine all ingredients in a small mixing bowl. 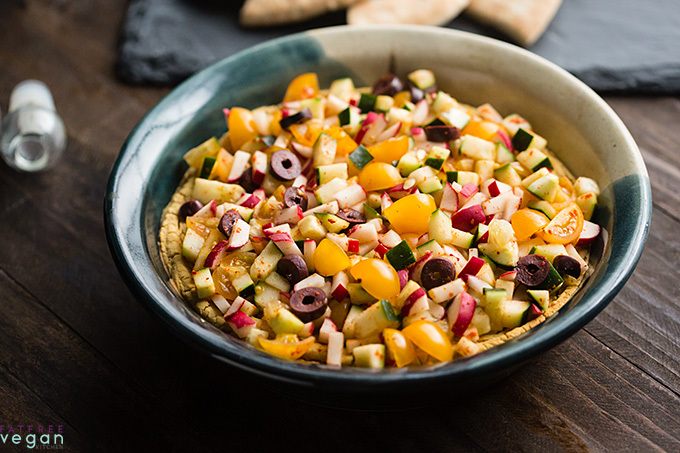 Spread the salad over the hummus and serve hot with pita bread as an appetizer. Aleppo pepper is medium spicy, and it's what I prefer in this recipe. Use red pepper flakes to make it very spicy or paprika to keep it mild. One serving on Weight Watchers Freestyle program is 1 point, though 2 servings is 3 points. Adapted from Turkish Hot Layered Hummus at Panning the Globe. If you enjoyed this recipe, please pin it and share! This post may contain Amazon affiliate links. When you buy something through them, I receive a commission that helps support this site. Thanks for your purchase! Looks delicious! I love the colors. I will have to make this the next time I make homemade pita bread. How interesting! I don’t particularly care for the hummus I’ve had here in the US. Compared to the hummus in the UK it is dry and thick, not tasty at all. Maybe the addition of a non-dairy milk or yogurt will help. I used to buy a hummus that was so lovely–asparagus, broad bean and mint. It was absolutely the best hummus I’ve had anywhere. As for heated hummus, I make a white bean dip that is baked and is simply divine. I’ve been craving it a while, and as soon as my beans from Rancho Gordo come in I think I’ll make it with some of their beans. Thanks for the recipe; will definitely fiddle with it (I’d go back to sundried tomatoes instead of fresh, since, like you with rutabagas, fresh tomatoes are one thing I can’t get past :)) . I’ve appreciated the resource you provide for fat free recipes. This time I’m disappointed. This is not a fat free recipe. As the name of your blog promises, I look to you to find fat free recipes that help me with my serious health issues. I can find recipes that have fat content anywhere. Maybe when you venture into fat included recipes, you could add something to the recipe name–such as, “Hot Layered Hummus (4.8 grams of fat)”– to let me know I don’t have to comb through paragraphs to be certain a given listing is actually a fat free recipe. To be fair to Susan, this recipe fits within the guidelines of Eat to Live and Susan has other recipes that also fit the same guidelines. And Dr. Fuhrman as far as I know only restricts his patients and interested readers to 1 ounce of nuts and seeds daily if they have heart disease or have lots of weight to lose. At any rate, it should only take a few moments to peruse the ingredients list to see if it works for you. If you have concerns about any ingredients, but the recipe looks good to you, try making substitutions (as Susan suggests in the text). Also, if you let a little time go by, commenters usually post what changes or omissions or additions they make, and somebody may mention making this or another recipe with substitutions that work for you. Best of luck with your dietary regimen. 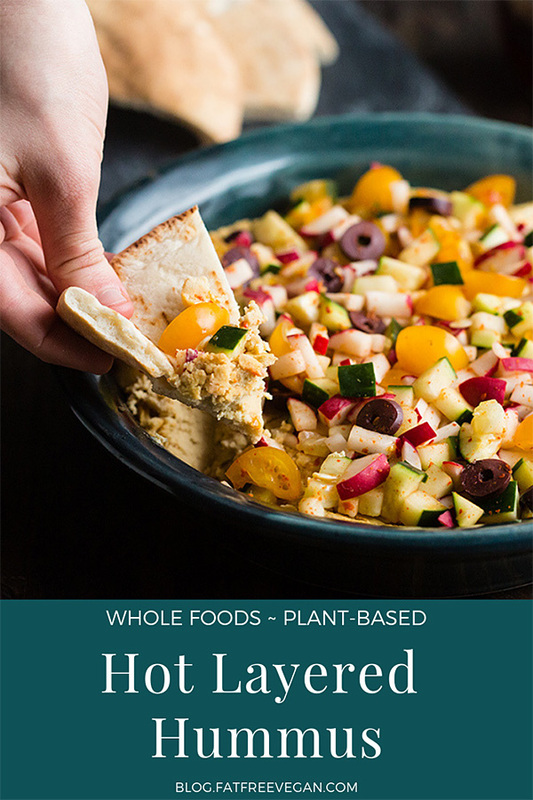 I plan on trying this one, I think I could be a big fan of heated hummus! And I know from experience that Susan’s hummus recipes are the ones I use more than any others on the internet, so I’m sure this will be a winner, too. Art with all respect to your feelings and experience, I’d love to remind all of us that maintaining an active blog, the cost of food preparation while experimenting with recipes before she is ready to share them with us, photographing gorgeously her dishes, keeping up to date with web design technology, attending blog conferences, creating new ideas for recipes, and sharing all this FREELY with such kindness and generosity, outside of visiting her amazon store, Susan is not getting rich off of this website. Im really happy to hear that you, like so many of us here are tending to our health through healthy lifestyle choices. It also sounds like you are very much aware of which food items work for you and which do not. Susan has long been supportive of readers modifying recipes to meet their dietary and taste preferences. In fact she has even welcomed such feedback. Continued success and good health to you. At the end of the day if one recipe doesn’t work for you and you don’t care to modify it to meet your needs perhaps you can just let that be. 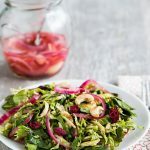 My hope is the hundreds if not thousands of other recipes on the site have brought you some joy and good healthy eating. May you allow your mind to dwell on those that serve you. T Colin Campbell, Fuhrman, et al all support a whole food plant based diet. Tahini is allowed as is some salt. The tahini is from a whole food (sesame seeds). If that does not work for you, by all means leave that out and enjoy!!! Life is short. All of us, including the greatest of creative plant based chefs also have feelings. Perhaps its just me, but while Im sure not intended, your post came across somewhat harsh and unkind in syntax and language. If you are here on the site, I trust you too have had much joy from reading and eating Susan’s delicious recipes. Thank you, Tom, for this excellent response as well as your enduring support for this blog. You don’t know how much it is appreciated! What a great suggestion! The commenters here are terrific adapters and very generous with their ideas. I know it won’t be long before someone posts about a tahini-less version of this recipe. First of all, I’m truly sorry about your health issues; believe me, I know how seriously they can affect one’s quality of life. I almost let this comment go because I know that usually when someone leaves a message like this it’s in the heat of the moment and they don’t come back to check the follow-ups. But in case anyone else is wondering about the issue of fat on a blog called FatFree Vegan Kitchen, I thought I would give a little more info about this recipe and my blog in general. Many times when I use a high-fat ingredient, it’s because I think it improves the overall flavor of the recipe; when I don’t think that flavor is essential, I mark the ingredient optional (as the kalamata olives probably should have been labeled here). But other times I include the high-fat ingredient because the chemistry of the dish, so to speak, needs a little fat for some reason or other. In my last recipe that used tahini, Mushroom Seitan Roast, the oil in the tahini coasts and shortens the strands of gluten (wheat protein) making them more tender. Most seitan recipes use much more fat to accomplish the same goal. In this recipe, I included tahini for two reasons. First, I don’t think hummus without at least a little tahini is hummus, but that’s a personal preference and a matter of taste. I often mark the tahini in my hummus recipes optional because others might not mind the flavor or texture of tahini-less hummus. The other, more important reason I included it in this recipe is that baking hummus dries it out. The original recipe used full-fat Greek yogurt, tahini, and half a cup of olive oil, which helps keep the hummus moist in the oven. My hummus was probably much drier than the original, but it would have been even more so without any tahini. 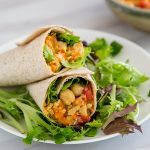 You may be surprised to learn that in this recipe, if you eliminate the tahini (2.4 grams of fat) and the olives (.66 grams of fat), you will still be left with 1.78 grams of fat per serving, mostly from the chickpeas (1.37 grams of fat). It truly is impossible to create a fat-free hummus. I think I provide a pretty good service just including the nutritional information at the end of each recipe and tagging those that are above 15% calories from fat as Higher-Fat at the end of the post. Most bloggers don’t do this. Calculating nutrition is not easy in general, and these days it requires me to go to a different computer than the one I use for everything else, enter in each ingredient and amount individually, and then, in many cases, enter in the complete nutritional information for individual ingredients not in my database. I really don’t think it’s asking too much for readers to scroll down to the end of the recipe, where the fat grams are always listed. Your blog is one of the few choices available that takes fat in the diet seriously. I eat (and modify) many of the meals here that I use weekly and monthly from your blog. It is my number one resource. I am amazed how confused most people are about what constitutes fat in food. Butter, olive oil, cheese, sour cream, nuts and seeds, avocado’s, meats, baked goods, and so many more high fat content foods are healthy for people without heart disease or other health concerns. Some of us have metabolisms and chemistries that are unable to handle these well. OH! A hummus recipe on fatfreevegan! I know hummus is nearly impossible to make without large amounts of fat. And I love(d) hummus, so when I saw you had a recipe for it, I was thrilled. How, I wondered, did she ever do it without fat? Yeah, maybe I just should have shrugged my shoulders. But in the moment, I was really disappointed and opened my keyboard. Wish I hadn’t. And you all have been kind in your reactions. Like many other of your regular followers, I appreciate your labor. I do not want to be even a momentary discouragement, so my apologies on saying anything. I remain one of your fans and use your recipes every week. As to my health, 18 months ago I was diagnosed with a blockage over 80% near my heart that can’t be reached with a stint (another blockage could be reached and the stint was an amazing improvement). If it gets much worse, it’s open heart surgery. I’ve been disciplined using the strict version of Dr Dean Ornish’s diet for reversing heart disease, and in the first 6 months following the discovery of these issues my cholesterol went from 209 (which wasn’t terrible) to 86. It’s been 18 months now, and I feel pretty healthy while remaining vigilant with what I eat. Thanks again for your labors, Susan. Art, you can make tahini/nut free hummus. Just leave out the tahini and nuts. There are other forums with those recipes if you don’t want to do that to these recipes. Engine2 and the McDougall forums have hummus recipes with no nuts/seeds or olives. I am so sorry about your health issues, but glad to hear how well you are now doing due to your dietary commitment and vigilance. I have been thinking about this recipe and wanted to suggest using cook eggplant in place of the tahini and add a little extra garlic and cumin. The cooked eggplant can help create the creamy texture that tahini would provide. I slice my eggplant into 1/4″ circles, lightly salt the eggplant and let it sit for about 20 minutes. Rinse off salt and pat dry. Place on baking sheet and broil in oven for 4-5 minutes on each side. Then place hot eggplant in a sealed bag and allow to ‘steam’ for about 5 minutes. Lastly, remove the eggplant peal…I would probably use about 1/2 cup cooked eggplant in this recipe. I hope this suggestion works for you and helps you to once again enjoy hummus! If you read her description for her website she says it is more accurately called “oil-free vegan” meaning no added oils. I also have a condition in which I have do drastically limit my fats. But I know of no diet that which allows zero fat. That wouldn’t be healthy at all. Also, the main fat sources here are tahini and olives. You can easily modify the recipe to omit these. Oh, Susan…this looks delicious!!! I most definitely will be making this. I think I understand what fat free vegan means. I think it means you usually don’t add any fat, but allow for foods that contain some fat…..wouldn’t it be pretty hard to be completely fat free…if not impossible…unless, of course, you’re OK surviving on ice cubes….. I know, I’m perseverating…even one raw banana has 1 gram of fat….. This looks so good!! I LOVE hummus…and if anyone is worried about the tahini…Cathy Fisher has a recipe for hummus using no tahini…….that said, I can’t wait to try this….thanks for sharing the recipe…. Honestly, you never cease to amaze me. Your creativity, your drive and energy. Huge admiration, respect and appreciation for you and all you do for us. You have been HUGELY instrumental in my plant based cooking skills over the years. I am forever appreciative. You have definitely made a difference in my life and health. I, too had a very bad experience with hummus. After my first round of chemotherapy, (10+ years ago) I ate lunch out and had a Mediterranean Plate. I don’t know what happened in my body, but it took 2 years to be able to eat cucumbers and olives. Hummus still makes me shudder. But this looks tempting! Thanks for sharing. Sounds yummy. I always like my hummus hot. I heat my chickpeas before making hummus. It makes it so much smoother. Then I like to eat it while still hot, or reheat it if I’m eating leftovers. Adding the veggies to the top would be nice. Hot hummus with mushrooms. Kind of simmered in a rich broth with onions, then spooned in the middle of a circle of warm hummus. Gorgeous. I always re-try foods I dislike every few years. I couldn’t eat raw tomatoes until I was 28, and still forced myself a bit after that. I still have to remind myself that I eat them now and don’t need to avoid them. Beets, well, they’re still on my “no, thanks” list. Sounds like a good way to take regular old hummus (which is delicious – I’m sure we can all agree) and make it into a hummus you would order at a fancy restaurant, but without the price tag! I’ve always used the cooking broth to make hummus, except for this recipe where I used non-dairy milk instead. I can’t imagine it any other way! Layered hummus, what an excellent idea. Sorry if this question is too particular, but did you use a field cucumber by chance? From the picture it kinda looks like it. I just thought it would provide a thicker, zucchini-like texture where long english might be too moist (I usually get long english, that’s why I’m checking ;)). I look forward to trying this nice, warm hummus dish and some pomegranate vinegar too! What a great post!!! Aren’t we humans funny about tastes 🙂 Yes, it is really good if we give some veggies a 2nd chance.. especially veggies..I wish more people would. It’s often the way they are prepared…or, if we mix them with something, then suddenly..we “love” them! salsify, turnips…and rutabaga!!!!!! Here are some great recipes that perhaps can convince you. You are one of my favorite vegan blogs. I always keep the positive hope that someday… we will convince all the “other’s? meateaters” to “switch over… 🙂 in the meantime…we are the luckiest people to enjoy such wonderful meals that are healthy for us, and kind to all beings on earth. For the salad I used chopped Roma tomato, red onion, diced jalapeno, and a few tablespoons of reserved chickpeas from the can. Next time I’ll use the kalamata olives but I didn’t have any today. I spread it on a toasted English muffin half. Thanks for the great recipe! I think heated hummus might become a staple! absolutely J’ADORE humous so I’m keen to try this but a bit trepidatious as I’m wondering why after a few goes in the blender, my humous doesn’t taste as nice as ones I buy from the shops? Could it be my garlic is too ‘sharp’, or is it because I don’t de-skin my chickpeas after cooking them? That’s a lot of questions, but I’ll try to answer them in order. I don’t de-skin chickpeas or use soda when cooking them. I just use regular garlic. The best hummus, to me, is when I cook the chickpeas in my pressure cooker and make the hummus when they’re still hot. (my daughter prefers canned chickpeas, though.) It comes out creamier with hot chickpeas, so you can even pre-heat canned chickpeas before blending. Thank you for your beautiful, delicious recipes! I refer everyone who asks about vegan or healthy recipes to your amazing forum. Susan, you ROCK! This looks great, but I don’t get the point of it. Maybe I just have an aversion to hot hummus, too! lol Does the hummus become crust like? Or is it simply nothing more than hot hummus? I’ve had warm hummus (right after cooking my chickpeas) with a pile of salad or raw veggies over the top, but I’ve never put it in the oven. I have never heated hummus, but after reading this, I must give it a try! Looks delicious! I love your site. You have great recipes. This looks delicious. I have to say I’ve been following your site for about a year now. I can’t thank you enough! You’ve really helped change the way me and my family eat for the better. You are amazing and are really, really making positive change in people’s life. It’s not easy to change old habits, but you make it easier and delicious! This sounds so good. Although you had to bad experience with hummus pizza this recipe seems like it would be a perfect pizza. And if you not ready to make your own pizza dough use the recommended pita bread (I think I shall split the pita bread in half because we like thin crust). I’m going to try it in the air fryer first. I’m sorry to hear about your bad encounter with rutabagas, but you’re missing out! Cut up in soups or roasted with other root veggies, they add an earthy, spicy flavour that can’t be duplicated. One of my favourite comfort foods is Finnish rutabaga casserole, a traditional Christmas food. It’s a bit heavy on dairy, so if you could veganize it, I’d be so grateful!